Desktops don't have to be big and bulky power-hungry monsters. This PC build guide will show you how to put together a slim, energy-efficient desktop PC perfect for your living room or small office. What Do You Want in Your Slim PC? Each member of my family has their own PC. My wife has one supplied by her work, I have multiple machines in the basement lab (plus an iPad and a laptop), and my daughter has a gaming-capable desktop PC. Even with all of those systems, we still share a computer that lives in the main living area of our home (which combines a dining room and living room into one large-ish room). This shared living-area computer is a great convenience when we just need to quickly fire up a browser and check something on the Web or respond to an email. For years, our shared system has been an aging Gateway laptop with a 17-inch screen. However, the keyboard has become gummy and disgusting, the display has dimmed, and the hard drive is small and slow, so we're more than due for a replacement. I could have just gotten another laptop, but I wanted a PC with a little more flexibility. Naturally, I don't want to spend a lot of money on this replacement. We don't need it for gaming, I won't be using any advanced networking features to connect to a network in a big corporate environment, and we don't need a particularly large display. The replacement does need to have a decent keyboard and mouse--preferably wireless and compact. Of course, this kind of PC is perfect for a small-office environment, too. Since I don't need this machine to be a powerhouse, I can save a few bucks with some strategic skimping. I don't need the computer to play perfect HD video, so I don't need to shell out for a beefy graphics card (and with the right low-end Sandy Bridge processor, the PC probably could handle HD video playback in a pinch anyway). Since I have no plans to connect to a corporate network, I can also go easy on the operating system side by using Windows 7 Home Premium rather than the more robust Windows 7 Professional or Ultimate editions. However, if you do plan on using this system in an office environment that would connect to a domain name server, you need Windows 7 Pro, which costs about $40 more than Home Premium. Ideally, I'd be able to skip the Windows fee entirely by installing Ubuntu or another user-friendly Linux distro. However, the other family members would probably throw several small objects at me if I tried to foist Linux on them. But other households might be different, so a good Linux distro like Ubuntu could be a good fit. Overall, I need this PC to be more responsive than the old laptop (with a faster storage system, more RAM, Windows 7, and a better CPU), but with relatively low power consumption. Admittedly, a desktop system with a separate display will likely consume more power than the 90W maximum power consumption of the old Gateway laptop, but I still want to keep it as low as possible. Also, I'll need it to wake from sleep/hibernation very quickly, since I won't want to shut this PC down very often. I'll also need Wi-Fi (since there aren't many ethernet ports in my living room) and a good wireless keyboard/mouse combo with long battery life. With these thoughts in mind, let's take a look at the component list. Since I'm building a compact system using integrated graphics, the parts list isn't very long. However, this isn't necessarily a cheap system build. I wasn't shooting for a budget target, but for functionality. 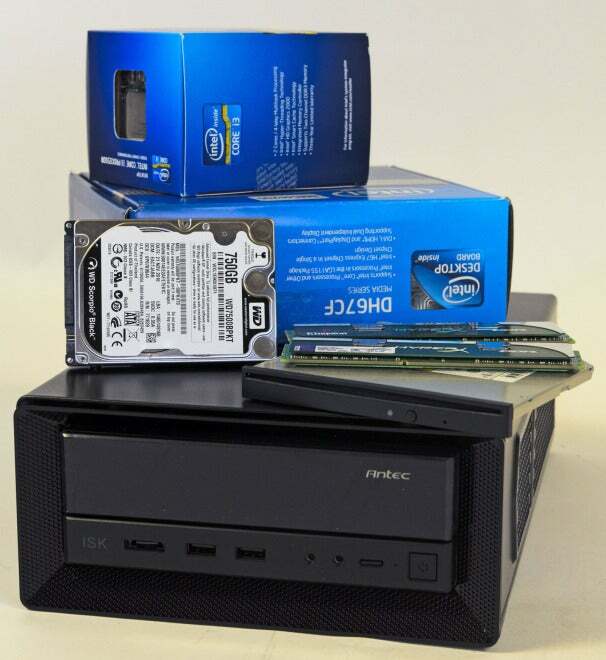 Using laptop-class parts, for example, pushes the price up a bit, as does using special, low-voltage DRAM. There aren't a lot of parts in this system, which is good. As you can see, the system costs a little under $700 before adding the last two items--the keyboard mouse/combo and the Wi-Fi dongle. This cost doesn't include a display, however. We'll discuss that in a bit. While I wanted to go small, I didn't want to go as tiny as you can get with some Atom-based systems. So I began with the CPU--an Intel Core i3 2100T. This CPU has a TDP (thermal design power) of just 35W, so it's very low power. Despite the low power consumption, it runs at 2.5GHz, which is perfectly fine for our uses, but there's no Turbo Boost on this CPU, so you can't push it any faster than that. On the other hand, it's a dual-core CPU that supports four threads via hyperthreading. The CPU also supports hardware virtualization, which can be useful in an office environment. However, the 2100T doesn't have Intel vPro or Trusted Execution, so it might not be suitable for larger enterprise setups that use a lot of remote management. 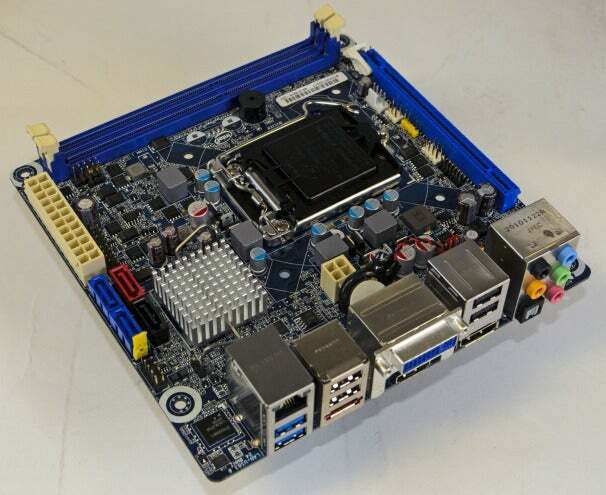 The motherboard is an Intel DH67CF, which is a mini-ITX board with two memory sockets. It does have a PCI Express x16 slot which could support a graphics card, but we're not going to use it in this build. It's got lots of ports, including a DisplayPort connection, which is what I plan on using to connect to the monitor. The only real oddity with this board is the CMOS battery. It's on the end of a wire, connected to the motherboard via a pair of pins. You can see the battery just behind the DVI port block. Intel's DH67CF is a tiny board capable of supporting Sandy Bridge CPUs. Intel recommends that CPUs used in this board don't exceed 65W, but that's mostly because the company anticipates the board being built into small enclosures. You could drop in a Core i7-2600K CPU, but only if you're sure you won't cook it inside a low-airflow case. Since the plan is to keep power consumption and physical size down, we needed to find a suitable mini-ITX case and power supply. The Antec ISK 300-150 fits the bill nicely, with it's understated black bezel and 150W PSU (power-supply unit). Note that Antec makes a similar case with a 65W PSU, which would probably have worked fine, but having a little headroom is never a bad thing. At idle, power consumption is still likely to be pretty low. 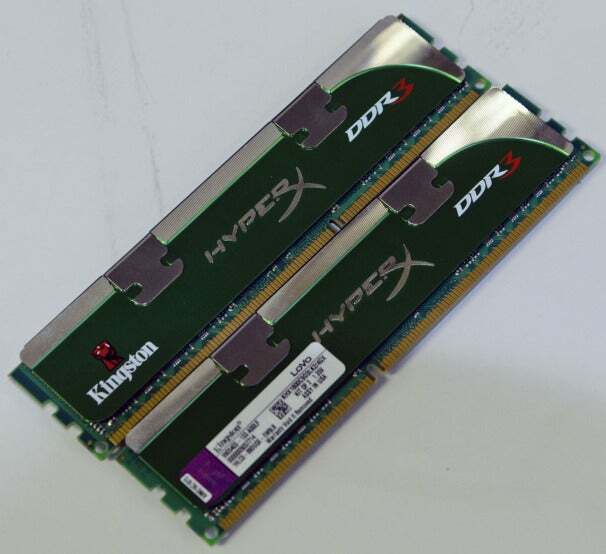 On the DRAM side, we used a pair of Kingston HyperX LoVo (low voltage) DDR3 modules in our quest to build a low-power-consumption system. However, it's worth noting that the Kingston LoVo DDR3 costs about twice as much as standard DDR3, so you could cut the cost by $45 or so if you're willing to deal with the increased power usage. Kingston's DDR3 LoVo DRAM requires just 1.35v. For this build, we're using a laptop hard drive and an optical drive. 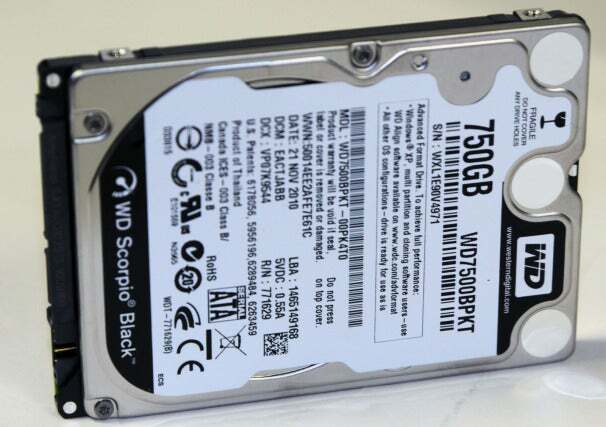 The hard drive is Western Digital's 7200-rpm Scorpio Black 750GB model--I was at first interested in dropping in a 120GB SSD, but that would have pushed the cost even higher, and I was already approaching $700. Western Digital's 750GB drive should have adequate performance and more than adequate capacity. 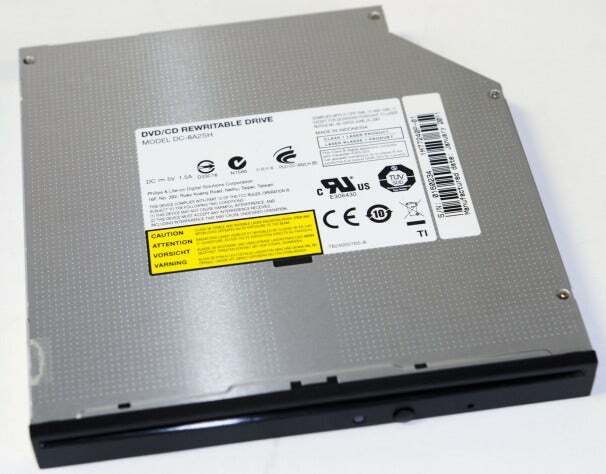 The optical drive is a $45 Lite-On DC-8A2SH, which is a slot-loading DVD rewritable drive. The slot-load feature is nice to have in a crowded, small-desk environment. LiteOn's slot-loading, compact DVD burner. The final item, not shown, is an Asus USB-N13 USB Wi-Fi dongle. It's just $23 to $25, and many similar Wi-Fi dongles exist. The price of the system--with Windows, but sans keyboard, mouse, and display--came in at $673. If you add a monitor and input devices, the price would increase to about $800. However, I already had several small Dell P2210 displays on hand. These small, 21.5-inch diagonal displays offer full 1080p resolution in a fairly compact package. You can still buy the P2210 for about $240, but even more cost-effective small monitors are likely available. I still lacked a keyboard and mouse, so I grabbed a Logitech Wireless MK520 combo. It's a nearly full-size keyboard with a wireless mouse, and the combo, according to Logitech, has a battery life approaching one year. That kind of lifetime is one thing I wanted in these accessories, and this Logitech set also turns out to be not a bad keyboard and mouse--though it would have been nice to have a back button under the thumb. The last accessory is an Asus USB-N13 Wi-Fi adapter. It's a little, thumb-drive-size 802.11n adapter you can find for 25 bucks, and should handle the Wi-Fi chores nicely. Right now, the system is attached via a CAT5e cable, but the computer desk will be moving shortly, and the Wi-Fi dongle will come in very handy. Make sure your components all play well together. Over the years, I've been bitten a number of times because some component won't work well with another. I've had graphics cards that wouldn't work with particular motherboards because they were long and blocked access to SATA ports. I've built compact, micro-ATX systems that weren't deep enough to accept high-performance graphics cards. And I've had power supplies that were just a little too long to fit inside a case and would block access to hard drive connectors. Doing a little research ahead of time to ensure all your components fit well is critical. Since the Antec NSK 300 uses laptop storage, it needs to support them properly. Antec thought of this, and included a laptop-style SATA power connector, which is smaller than the SATA power connection used in desktop drives. 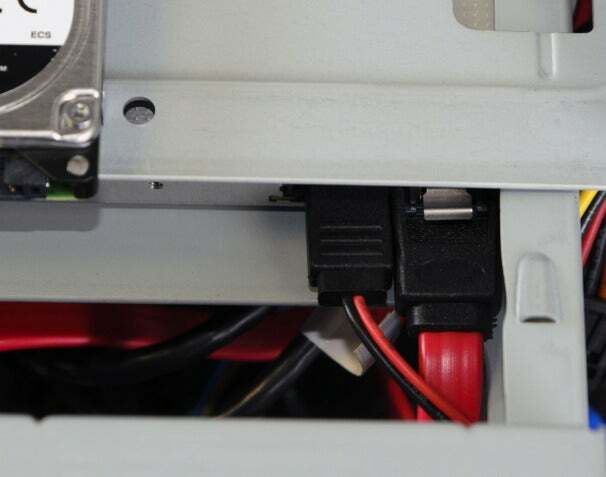 See the power connector to the left of the SATA data cable? That's specifically to connect to laptop drive SATA power. 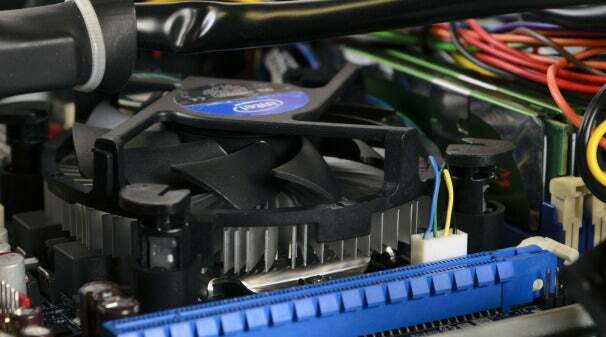 In such tight quarters, issues like the CPU cooler can create issues, too. However, Intel's Core i3-2100T ships with the lowest profile CPU cooler I've ever seen. See how the CPU cooler is shorter than the DRAM module behind it? That's low profile. The Intel cooler won't win any awards for cooling an overclocked CPU--but that's not what it's designed to do. Rather, it's designed to keep a 35W CPU sufficiently cool to work in a small case. And it seems to do that well enough; idle temperatures were around 40 to 45 degrees Centigrade. Once I assembled everything, the Windows install went smoothly. The Antec case ships with a bracket that allows you to stand the case on its side, so it takes up less desk space. And because the keyboard and mouse are wireless, I can keep them on top of the case when I'm not using them. The system attaches to the monitor via a single, short DisplayPort cable, so it has only two wires: the monitor cable and power line. You could build a lower-cost system with just a few tweaks to what I've outlined here. Using a slightly larger case, for example, would have allowed me to use desktop storage, which would cut the price a bit. But overall, it's a solid little system that will do well in my living room--or your small office.